Ngorongoro is possibly among Africa's most popular wildlife destinations. Almost everyone who wants to visit Tanzania has this amazing phenomenon on his or her list. Ngorongoro Conservation Area is not a national park, and it was established to conserve wildlife and other natural resources. You may also see the Masai People who are allowed to live in the conservation area with their livestock. Ngorongoro is believed to have formed millions of years ago, and was once a gigantic volcano perhaps taller than Kilimanjaro. After a large eruption its long peak collapsed, eroded over time and left the famous Ngorongoro crater as we see it today. The crater is a memorable experience. Within 260 square kiliometres there is Lake Magadi, Lerai Forest, Gorigo Swamp, short grass, long grass, and woodland. Almost 3,000 animals live in the crater including large herds of Buffalo, Elephant, Wildebeest, Zebra, Hippos, Lions, Hyaenas, Leopard, Cheetah and the endangered Black Rhino. Is one of Tanzania spectacular smaller parks, established to protect the Elephant herds that have made this area renowned. The park size of 330 square kilometers provides an excellent wildlife experience. Visit the park ground water forest which is fed by small rivers flowing down the escarpment, Acacia woodland, short grass plains and swamp where you will encounter large herds of Buffalo, Masai giraffe, Wildebeest, Zebra, Impala, Hippo and Bushbuck while the alkaline lake attracts over 380 species particularly Flamingos, Pelicans and migrant birds. 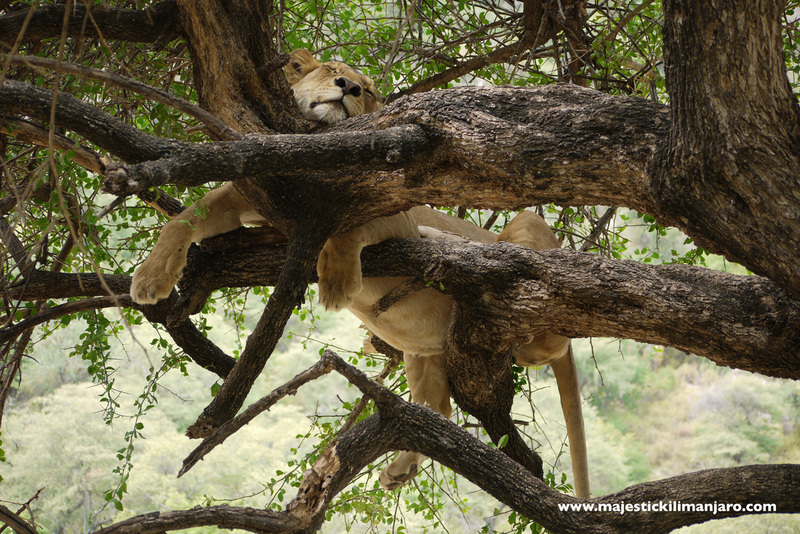 Apart from Elephants, Lake Manyara is famous for tree climbing lions which spend hours on the branches of the Acacia trees 3-6 meters above the ground, and for it's large troop of Baboons. Lake Manyara National Park, is a truly memorable place to visit. Tarangire national park is the least visited park in the Rift Valley close to the eastern shore of Lake Manyara. The Tarangire river from which the park derives it's names is one of the few sources of permanent water within 2,600 square kilometers of the park area. All year around huge herds of over 300 Elephants roam through the park. The park has nearly as high a concentration of animal life as Ngorongoro Crater. During the dry season it is possible to see large herds of Elephant, Zebra, Wildebeest, Oryx, Eland and Impala congregating down at the river drinking while awaiting the rain. The park is truly spectacular with the majestic Baobab trees covering most of the area. Arusha National Park lies between the Peaks of Mt.Kilimanjaro and Mt.Meru and covers an area of 552 square kilometres. Because of it's proximity to Arusha and it's size is an ideal place for a day trip. 1. The MT. MERU, section of Arusha National Park, which lies on the west of Ngarenanyuki River, offers one of the most remarkable landscape in Africa. This is the fifth highest mountain in Africa at 4,556m. Its terrain is a mixture of lush forest and bare rocks. Animals which can be found in the park are Elephant, Zebra, Baboon, Leopard, Hyena wide range of Antelopes species. 2. MOMELLA LAKES, both small and big Momella lakes were formed after the formation of The Great Rift Valley, 20 million years ago. Each lake is a different hue of green or blue. The Lakes are fed predominantly by underground stream and are not very deep. The area is famous for it's birdlife, 400 species of birds both migrant and resident have been recorded in the park. In addition to the large Flamingo population some species include Crowned Eagle, Hammerkop, Egyptian Goose and Silver Cheeked hornbills. 3. NGURDOTO CRATER is a volcanic crater surrounded by forest. It is a place to spot Black and White Colobus Monkey while the Crater floor is a swamp. The crater is 3 kilometers from rim to rim. On the Crater swamp floor is where Buffalo and Warthogs can often be seen. The Serengeti is Tanzania's oldest and most popular wildlife area of East Africa. The park's name means endless plains in Maasai language.The park's 14,700 sq kilometre landscape is dominated by Zebra and Wildebeest. These animals are the centre of life in the area. It's from this largest wildlife sanctuary that massive concentration of 1.5 million wildebeest and Zebra commence the annual great migration in search of new pastures, providing one of the greatest natural spectacles to be found any where in the world. The park lies in the high plateau between Ngorongoro highland and Kenyan borders and extend nearly all the way to Lake Victoria in the west. The landscape of the park with it's short grass southern plains, savanna dotted with acacia and granite rocks "kopjes" and riverine bush and forest in the north offers the excellent opportunities to view the game. Different events occur at different time of the year in different location within Serengeti. The timing of Wildebeest migration changes annually and it's a very unpredictable natural event . There are three season in Serengeti: Short rain, long rain and dry season. During November and December the herds of Wildebeest and Zebra leave the Northern part of Maasai Mara into the short grass plains of the southern and eastern Serengeti. The calving season takes place between the month of January and March. Females need to be in this area to begin the birth as they require this particular kind of grass for the milk production that is high of calcium and magnessium. Also the short grass plains offer more protection against the predators. You have high chance to see the kill at this time as more than 500,000 females drop their calves within 3 week period of time, which make a lot of easy meal for the predators. Heavy rain for longer period of time start normally in April. Now herds need to move to the central Serengeti to begin rutting in May and June. Between May to the end of July the herds continues to move both west and north some will remain in the western corridor. The best time to see crossings on Grumeti river is July/August and October/November on the Mara River. Wildebeest Migration is the most amazing scene in all Africa. Majestic Kilimanjaro can organize a Hot Air Balloon Safaris for an unforgettable experience.